Southern Cross artists set up a beautiful Exhibition of works by our members. The display takes place in the Atrium at Sutherland Hospital (in conjunction with the Hospital's annual Fete). 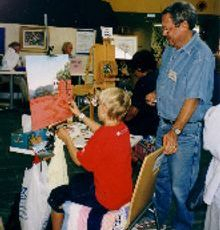 This photograph shows artist Jim Flood encouraging a new apprentice. One of our artists donates a painting which is raffled with every last cent of takings being donated to the Hospital for one of their special projects. At our Opening Night party we make a donation to the hospital of the proceeds of our raffles for the previous year. NOTE: At the current time this exhibition is not being held. 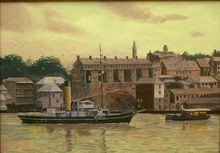 Our major Art Show and Sale of Paintings each year is held in October at Menai Marketplace. 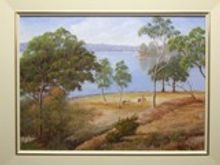 Once again we raffle a donated painting and donate all the proceeds to Sutherland Hospital. Some of our artists spend time demonstrating their artistic talents in public and this has proved to be a very popular activity with people who are passing by. People are very interested to be able to chat with the artists and to find out how we go about putting a scene on canvas. Our artists are keen to help Sutherland Hospital's staff and patients. We raffle several paintings during the year and present the Hospital with the TOTAL proceeds of these raffles. The Hospital's current project is the provision of theatre monitors at a cost of some $80,000 each, a huge undertaking which we have pleasure in supporting. Opposite are just two of the paintings donated by our artists which have been raffled . . . .